CCSD Board Vice-President Lloyd Harwood receive a Colorado Association of School Boards McGuffy award. My first expression of gratitude this week goes out to the parents and guardians of our Washington Elementary students. Last week they exemplified our fourth core belief by participating in their back to school open house event at the highest rate in the past seven years. I’m told nearly 70% of them attended! Of course a gigantic thank you goes out to the entire Washington staff as well, for creating such an inviting learning community. I also want to thank the staff of Lincoln School of Science and Technology staff for an outstanding start to their school year. Last week they expereinced their first literacy consultant walkthrough of the year, and I’m told each classroom exhibited a caring and comfortable learning environment, literacy materials and visual supports were organized and readily available, and students were deeply engaged in learning. I was especially impressed by how quickly Lincoln’s K-2 staff has already set up small group instruction routines. Of course, last week was also Lincoln’s first Super Science Friday event of the year. This allowed students to trek to the Arkansas River to conduct experiments. What a great way to support our core beliefs on student learnign growth, and developing key traits and skills for future success. A big thank you also goes to Cañon City High School SRO Jeff Canada for the great work he has been doing in his role, including monitoring and helping to change the culture at Rudd Park, and supporting classroom instruction on school safety and student wellness. Several folks reached out to me this week to highlight Jeff’s great work, and I just want to echo their sentiments. Officer Canada is a prime example of how we strive to meet the social-emotional needs of all students first. On Monday night in Colorado Springs Cañon City School Board Vice-President Lloyd Harwood was honored with a Colorado Association of School Boards McGuffey Award. McGuffy’s are given to board directors who exhibit strong local leadership. Mr. Harwood will soon begin his 8th year of service on the Cañon City Fremont RE-1 Board of Education. He started with the goal of positively transforming Cañon City High School and improving the condition of facilities throughout the district. Thanks to Mr. Harwood’s participation on the Cañon 2020 committee, his leadership on the board, and outstanding work by the CCHS staff, the transformation of Cañon City High School is well on its way to being achieved. Additionally, no small thanks to Mr. Harwood’s legislative advocacy aimed at expanding funding for Colorado’s Building Excellent Schools Today program, Cañon City Schools has already been able to significantly upgrade 5 of its current facilities and will also soon be replacing two that are beyond repair. Congratulations Lloyd, you truly exhibit our 4th core belief each day by emphasizing what’s best for kids! 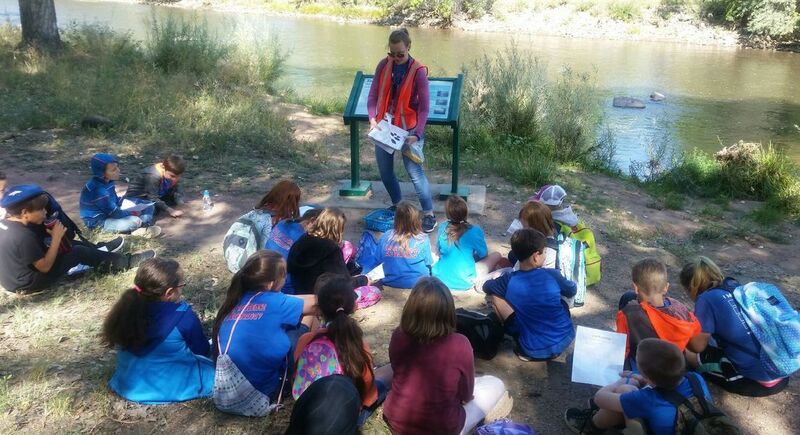 Lincoln School of Science and Technology students experienced Super Science Friday activities along the Arkansas River. Washington design team members debate the best location fro key structures. It’s hard to believe we’ve already completed our fourth full week of school. Though it’s early in the year, Assistant Superintendent of Schools Adam Hartman and I have noticed the large volume of instructional walkthrough feedback coming from our building leaders. These classroom visits take place both in support of our annual teacher evaluation process, as well as the main reason, to offer feedback for instructional improvement. I want to thank our administrative staff for their hard work on this front, and our teachers for taking feedback offered to heart. In doing so, each exhibit our belief that learning growth is what matters most (even for adults) and that it occasionally requires taking risks. On Tuesday and Wednesday last week board directors Larry Oddo, Lloyd Harwood, Mary Kay Evans, and Shad Johnson interviewed eight candidates interested in filling Kristyn Econome’s open board seat. This was a ton of work, and I have no doubt their decision will be difficult to make. We expect the board to seat our new director on Monday evening. CCMS Design Team members review a possible floor plan that flips new structures to the west of the property. At our building design meetings this week we took further steps toward envisioning how each building will occupy their property and where we’ll locate major spaces. The CCMS process included an intriguing proposal to flip the current design, putting all the new structures on the West side of the property. The deeper we get into the Washington design process the more we have come to realize just how challenging it will be to fit that building on currently available space while we continue to occupy the old one. We have a design break this week, and look forward to seeing what our architects have done to incorporate our latest suggestions when we come back together during the week of October 1st. My schedule last week included several parent meetings, a trip to Springs for the CASB Fall Regional, BSERT, SAC, and CCMS and Washington design meetings. I also had staff recruitment, and Instructional PLC planning meetings, and on Thursday I taught a full day Leadership Cañon session and ended the day in our first IBS session on Recruiting and Retaining High-Quality staff. On Friday I had a high school business department fundraiser meeting, attended the weekly Tech-Start lunch and learn, and caught up on office correspondence. Former DHS Director Steve Clifton helped me kick off the 2018 leadership Cañon Cohort. My schedule for this week includes o Monday board work session and meeting, some student expulsion hearings, our weekly SAC meeting, our first Instructional Leader PLC of the school year, a quarterly Fremont County Workplace Learning Board lunch meeting, and a meeting out at Southern Peaks to discuss the possibility they might provide day treatment for some of our students in need.